Like having a sound engineer in your pocket! Get rid of your bulky laptop. Show Cues runs your entire show with a device you already carry with you—an iPhone/iPad or iPod Touch! What's the difference between Show Cues and other sound devices? About $1500! Show Cues doesn't run lights, flash pots or make coffee. But, if you're looking for something super-simple and sure-fire, this App really does the trick. In fact, you can bundle Show Cues with the purchase of a new iPad and it would still cost less than other sound devices on the market. entire show from an iPad or iPhone! By far THE BEST on the market." Carl Andrews is not only a designer and programmer of iDevice apps, he is also a working professional magician. When his friend Shawn Popp suggested that he create an app to play music cues, he went at it with passion. The result is the most professional program I have ever seen called Show Cues. There are so many features to this app I won't have enough time to go through them all. A wonderfully written manual and a professionally thought out program makes this a must for all performers. "Designed to function as a simple, visual, user-friendly interface for either the performer or the most experienced sound tech. It would be a challenge to make this program more convenient. 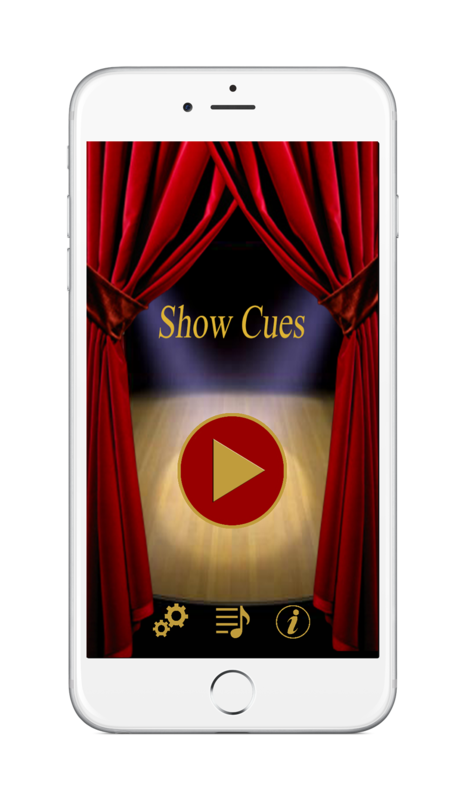 Show Cues is music to my "i"s."
"This is an app that gives you or your sound technician quick, simple, and reliable control over the music and sound effects that support your show. It exceeded expectations, meaning it worked perfectly right out of the box. This is a professional tool designed by a professional, for professionals. But we part-time pros can like it, too." "In the past I have used so many different music systems to provide the backing for my shows. This might sound big time but it isn't meant to be but SO many cues have been missed in the past by technicians in all kinds of venues. Recently I purchased "SHOW CUES"... note I am NOT getting paid to say this! I found it unbelievably simple to create a list of the music and sounds that I needed and create the cues for the techie guys. Last week I was on a ship. The sound engineer had never seen "SHOW CUES" before but the show was flawless. Every cue was spot on. I know this system was created for use by magicians but other performers on the ship, singers and multi instrumentalists, were all asking where to get it. I highly and freely recommend "SHOW CUES" and I have now started to play with the iJet controller... so far.... impressed!" We made the decision to control our own show music over 20 years ago and we’ve never looked back. 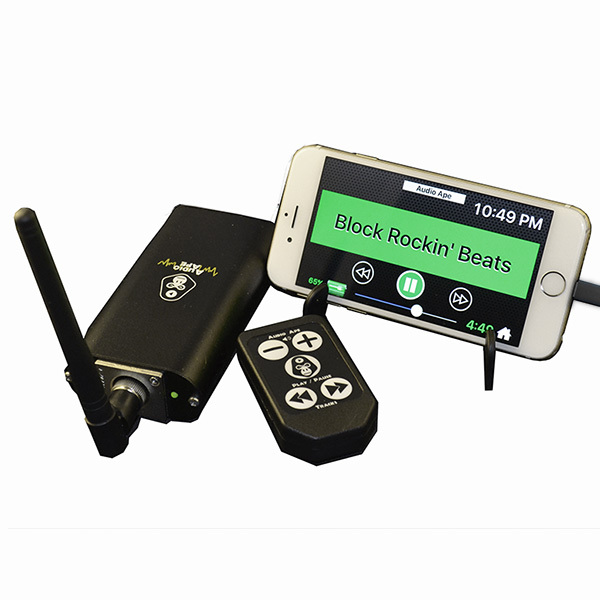 When we recently decided to switch to an Audio Ape remote, we started looking at music apps to go with it. After evaluating a couple of different apps, we settled on Show Cues. It’s amazing how much more we can now do with our music compared with the systems we used in the past. We thank Carl for helping to make our switch to a new remote music system easy and pain-free. Like so many other professional performers, we’re big fans of Show Cues! "Without a doubt the best break through in technology in 35 years! If you are a performer and are not using this app then your act is not getting the attention it deserves. So many features. Great tech support!!! 3 thumbs up!" "I'm writing to you regarding your Show Cues system. First of all I want to congratulate you for it. I think it is a fantastic piece of help for all magicians, and other entertainers out there. Lots of people know about it, but even more should. Great piece of equipment! Thanks again! I love using your device." "How good is Show Cues? It is Great. Having the Volume Control, Next Track and Pause/Play right ON the cue sheet is so intuitive and easy to use that even someone who has never seen your show can run it.Simple and powerful! Add a remote control if you want to run it yourself with the track Name showing big and bright on your iPad screen. Show Cues is a real winner! Highly recommended." "Carl has designed the BEST, SIMPLEST sound cue device ever! We use it to run ALL our sound needs, at the theatre and beyond. I LOVE the fact that you don't need to be near a sound board, tech booth, or tech person! "Great app! Love it! wow this should be a app for every professional entertainer. If you are entertainer you need this app. It worth it's weight in gold." "With every update, this system gets better and better. I can't say enough positive things about how well this works now and the incredible customer service that comes along with the purchase. It is a dream to be able to run the audio during my show with something I already travel with. Thank you for making a great, useful product that is now exceeding my expectations! " "Show Cues is one of the greatest apps for the stand-up entertainer in existence. It does everything you need. Say goodbye to the $1000-plus sound cueing hardware. Fabulous support and customer service, which triples the value in my book. I can't wait for the next upgrade, which will allow me to pre-set separate volume controls for each track. The best keeps getting better." "It's a well designed piece of kit for the working pro. For me and hundreds of others out in the 'trenches' gigging for a living, it's fantastic! I handed my iPad to the sound engineer to run my cues - which he did, superbly. He LOVED this app - quote 'I'm having that!' A well thought out and easy to use app. " "Never deal with a ship's sound tech again! Double the price Carl! Seriously, having spent $1800 on another sound device, it astounds me what a great job you have done thinking out this App. Congratulations." "Just started using the great app. For my one man show it's perfect!" "I'll be using it at the Magic Castle the rest of the week. It's fantastic!" "Fantastic Carl! Finally, won't have to carry the extra gear. Thanks for the reasonable price too!" "I purchased Show Cues for my iPhone 4 and it is fantastic. This is exactly what I've been hoping and looking for. I'm am so thankful"
"You have a real winner for those who choose to see the benefits, the cost is way to minimal!" "I gotta say this is without question the best software option for playing music hands down. It's beyond great. I have had every system you can think of, including the mp3 tech and this blows them all away, ESP with these new updates. I'm not sure what else you plan on doing to improve this, but it's phenomenal. Well done!" "A killer App for performers of all kinds. Show Cues is the bomb! Virtually no set up!" "If this App doesn't take over the entertainment world, I'd s#*t myself!" "Great App. I am a full time professional entertainer and it rocks! Almost anyone can act as your sound person with this great App! So simple and effective!" "Overall this is a Great, Easy to use App. I just put it to my first live use on Sunday, after just getting it on Saturday night! Thanks for all your efforts into developing this for the magic community! "I am happy with the App, and it makes the Virtual Soundman and Show tech and all other hardware dependent music controllers obsolete. Great job, keep it up." "You two are awesome! I'm loving the changes you made. You are approaching art with Show Cues 2.0. Thank you Carl and Shawn." "I've just downloaded show cues from the AppStore and its undoubtedly perfect for my shows - exactly what I was looking for. " "It works perfect and i love that app!" "My name is Christian Engblom, and I hail from Finland. I was recently In New York, and was treated to Steve Cohen's wonderful show, at the Waldorf-Astoria Hotel. We had a great conversation afterwards, where he showed and recommended your Show Cues app. " "Using music elevates both your performance and your show. What holds many people back is the perceived difficulty in using music while they perform. ShowCues makes it so easy to manage and control your music even while performing. I use this fantastic app in every show I do, and I believe that once you give it a try, you will use it as much as I do. This app gets my highest rating!" "Not afraid to say it. "I'm a fan!" "I have paid a lot more for other show music programs and devices and I have tried the less expensive apps, too. None compare with the functionality, ease and convenience of Show Cues. Carl and Shawn have created an indispensable program that allows me to easily prep my show music, remix and control on the fly for any program I perform, from a small living room setting to a cruise ship stage. I highly recommend it whether you are a full time pro or the occasional performer. It gives your act an added boost that separates you from the common conjuror." "Just wanted to say that I love your app and am so glad that you put this out on the market! " " Definitely worth the money! I never had music in my show before. This app inspired me so much that I put music in and now I'm always on time finishing my show. So, if you need music or just timing for your show, this is the app to get. " " A true professional piece for the professional magician. " " I only bought one thing at Magic Live this year, a remote for Show Cues and then downloaded the App. I can tell you it was the best thing I did, magic-wise all year. GREAT PRODUCT! " “I took the risk and bought it. When I arrived to the show, I gave the iPad to the sound crew, I pointed out the stop and start buttons and what to look for in the show. The music ran perfectly! When the sound guy gave me back the iPad, he exclaimed to me that this was the best sound management tool he has ever used. He said the on screen instructions were very clear and self explanatory. He said running the music was "too easy". So, THANK YOU, Carl, for building this app. I now need to get to know it with the ijet remote. But, without the remote and just handing the iPad to a stage sound tech, they will be amazed at how easy it is to run the music and follow the on screen cues for your show and will thank you afterwards for making their duties seem so effortless. For them it was "plug and play". What could be simpler? I have paid a lot more for other show music programs and devices and I have tried the less expensive apps, too. None compare with the functionality, ease and convenience of Show Cues. Carl and Shawn have created an indispensable program that allows me to easily prep my show music, remix and control on the fly for any program I perform, from a small living room setting to a cruise ship stage. I highly recommend it whether you are a full time pro or the occasional performer. It gives your act an added boost that separates you from the common conjuror. If your an entertainer teacher or anyone who needs a remote audio control this is great. I have all of the apps, software, and hardware for playing audio tracks by remote. A few are good-Some are very expensive, some are junk, hard to program or have bad to no customer service. Here are a few reason I like this app. First ) the price is right very low for a good remote system. Second ) using my iPod is light and has a big screen for viewing tracks. ( I have paid a few hundred dollars in the past just for the ability to see track names.). .. Three) if something happens to my IPad I'am not screwed --- I just plug my iPhone in and I have another complete system. Don't hesitate. If you are a performer or presenter who uses music, pre-recorded intros or narration, then you will be on top of the world with this app. The features listed make this an obviously well thought out product. The best part is that it is created and managed by a fellow performer who provides great service, & cares enough to continue making improvements. This isn't just a tool, it's an investment. This app is perfect for controlling your music during almost any kind of performance. Easy to use, quick response and so far very reliable. Perfectly thought out! Operates the way you wants a music player to work. Great for a 'one man' show. Highly recommended. © Carl R Andrews, Inc.